He who fights with monsters should look to it that he himself does not become a monster. And if you gaze long into an abyss, the abyss also gazes into you. - Friedrich Nietszche. However, I can't help but notice the disproportionate representation of political beliefs in mainstream media, where the minority political opinion overwhelmingly drowns the political opinion of most. Ninety-one percent of Filipinos trust Duterte [GMA]. Meanwhile, seventy-four percent approve of his performance [CBS]. Despite this, I find it disturbing that the vast majority of news bits Filipinos have been reading daily since the old man took his oath have been overwhelmingly critical of the president. That is, it appears to me that a vast majority of media men belong to the 0.2 percent of the population who distrust Duterte [Star], or the 11 percent who are dissatisfied in his performance [BW]. Mainstream discourse on Philippine Politics today is dominated, if not monopolized, by the minority, with the Philippine Daily Inquirer (PDI) leading the pack. PDI started it with the Kill List, which blamed upon the administration virtually all vigilante killings. Using the list, PDI claimed “a dramatic and unmistakable” rise in extrajudicial killings since Duterte took office. Despite its extremely problematic, irresponsible, and unscientific methodology [TP: Kill List], PDI continued peddling this list to international news outlets, alienating Western Media from the Philippine Government. To top it all off, no less than Inquirer Editor-in-Chief John Nery, who’s supposed to be impartial on the issue, actively influences international publications to be negative of Duterte, despite of his lack of evidence, despite his lack of first-hand knowledge on the EJK issue [LATimes]. I repeat: three in four Filipinos approve of Duterte, but a vast majority of news bits today do not. I examined Strategic and Consumer Media Insights (SCMI)’s 2016 Philippine Media Overview [PANA]. SCMI reported that in its 2014 survey, free-to-air TV dominated daily media reach at 91 percent of the general population. Mobile phones were 2nd at 79 percent, and internet 3rd with 38 percent. Only 8 percent regularly access newspapers. The story is different for millennials, or those who came of age after the turn of the millennium, where mobile phone was at 95 percent, TV at 86, and Internet at 54.life. Basically, mobile phones and the internet are over traditional media (TV, Radio, Newspaper) as the primary platform for information dissemination. It is not unreasonable to conclude that in the near future, social media will become the primary political battleground. Truth be told, this may have already happened, as evidenced by Duterte’s May 2016 win. Duterte won because of Free Facebook that allowed him to reach 46 percent of the electorate [CampaignAsia]. Yes, evidence suggests that social media is “it”, and mainstream media is feeling the heat as it faces serious challenges from a new mosquito press: the Millennial Mosquito Press. The “Mosquito Press” refers to small and independent publications that continued to criticize the Martial Law government despite the dangers that it entailed. 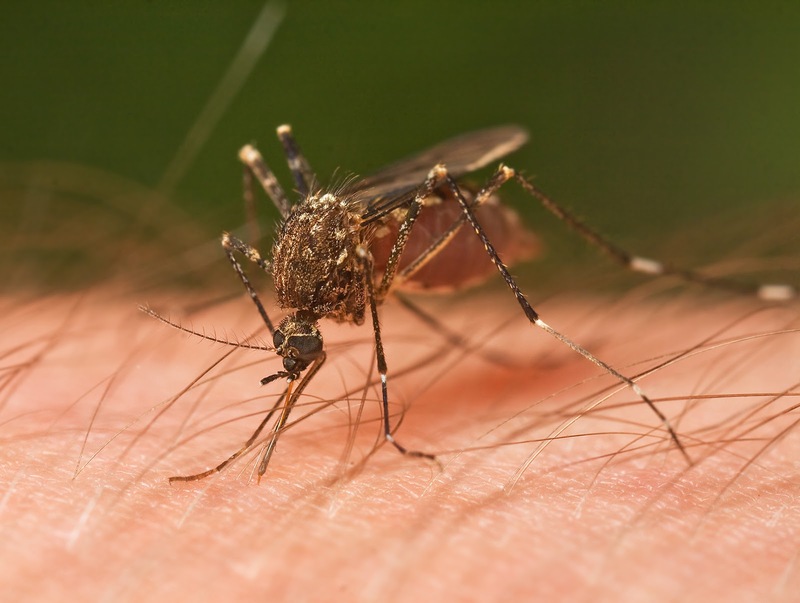 These publications were likened to mosquitos, small creatures that carry a stinging bite. The Marcos-era mosquito press served as alternative sources of information at a time when state-controlled mainstream media provided limited information. It was the mosquito press that “exposed” then-budding intellectuals like UP Mass Communication Professor Danny Arao “to both the truths and the lies about martial law and the so-called New Society [Arao 2006].”“Mr. and Mrs. Special Edition” tabloid editor Letty Jimenez-Magsanoc (LJM) was one of the icons of the Marcos-era mosquito press. Before Mr. and Mrs., LJM worked for the Manila Bulettin’s Panorama Magazine, where she was fired for writing articles that poked fun on Pres. Marcos [Inq]. Mr. and Mrs. is the predecessor of today’s Philippine Daily Inquirer [Inq]. Yes, the mosquito press of old has become the mainstream of the past three decades. But with the emergence of social media, this new mainstream is challenged by a new, social media-based, mosquito press: the Millennial Mosquito Press. I could have easily dismissed these suspicions if not for the fact that mainstream media has started reacting to reactions from the public, something that it rarely did before social media became en vogue. Ten years ago, public reactions were usually confined to “Letters to the Editor” sections of newspapers, a section that even I, during my newspaper-reading days, did not give a damn about. Today, however, mainstream outlets have started complaining about netizen behavior, suggesting that the former is starting to feel the heat. Many mainstream media people, led by the National Union of Journalists (NUJP) in the Philippines, recently decried the supposed silencing of political dissent as they accuse Duterte supporters of threatening some mainstream journalists for criticizing the President [Inq]. Ironically, NUJP’s president is a veteran reporter of the Philippine Daily Inquirer [Inq]. I categorically condemn threats of violence, and I respect NUJP’s right to pursue legal action against abusive netizens. However, this NUJP reaction suggests a shifting of the tides, a redistribution of power over the shaping of political discourse. But Inquirer-NUJP isn’t the only one. Last month, several camps, including a university professor “SC”, who actively contributes for Rappler, accused ThinkingPinoy of receiving millions of pesos in exchange for supporting the Duterte Administration. SC, in particular, could not believe that ThinkingPinoy is a one-man operation, even going as far as saying that it should be operated by a team of people. 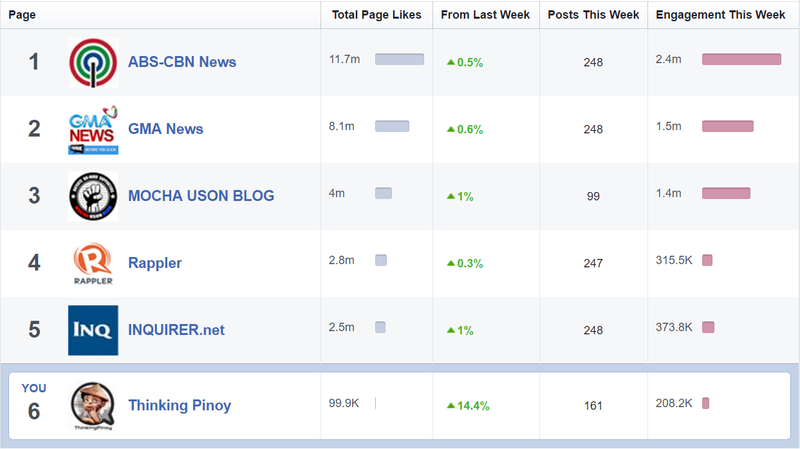 A few days before that incident, I published “Mainstream vs Indie: Who’s winning the Social Media Wars?, where I discovered that in terms of Facebook user engagement, ThinkingPinoy is starting to rival Rappler’s Facebook performance. 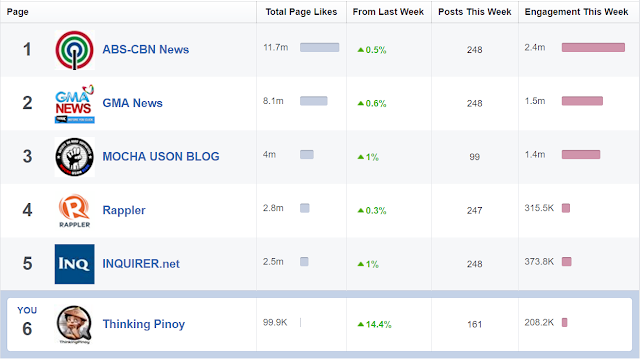 Moreover, on an engagement-per-post basis, ThinkingPinoy exceeds Rappler by over 10%. Fast forward to a few days ago, veteran journalist and Rappler founder Maria Ressa, using the all-too-convenient “undisclosed sources” strategy, went ahead and accused several Duterte-aligned social media entities as part of a large-scale, well-funded online propaganda machine. Ressa also accused these Duterte-aligned pages of “gaming” Facebook’s algorithm, suggesting that Rappler should’ve been on top of the rankings instead. 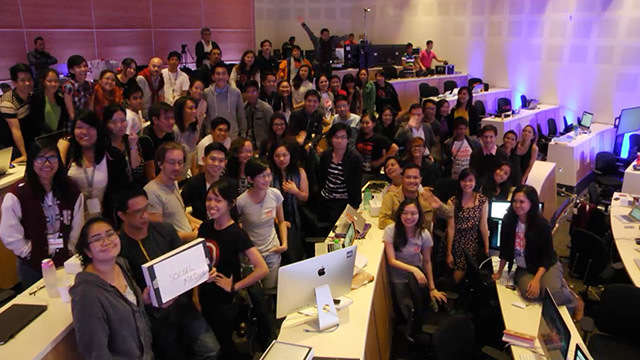 Interestingly, Ressa was on a meeting with Rappler investor Omidyar Network on the same day the article was published. As a side note, I think it’s quite ironic that Ressa makes major funding for Duterte supporters appear like it’s necessarily evil, when the fact of the matter is that Rappler, a social media entity in itself, receives major funding. But I am digressing. Given this, it appears that Ressa’s “undisclosed source” may actually the same person who made that accusation last month. Regardless, these recent developments suggest that traditional media companies such as the Philippine Daily Inquirer and Rappler, characterized by large-scale funding and large workforces, have started to feel threatened, and for good reason. Facebook is the undisputed leader in social media platforms in the country: with Free Data promos, I think's that's pretty obvious. Add the fact that Filipinos being second only to Brazilians in terms of time spent online [WeAreSocial]. Facebook, plus the lack of diversity in political opinion in mainstream media, is what helped fuel the rise of the new Mosquito Press. The Millenial Mosquito Press. Now, I can try to analyze how mainstream media companies perform with respect to other social media players, but that will take too long and I doubt that I can say everything in just 2000 words. Instead, I will focus on two major mainstream players: Inquirer and Rappler. If there's something that Inquirer and Rappler shares, it's their disdain for Duterte and their reverence for everything Liberal Party. Thus, I felt its best to compare their social media presence to those of Duterte-aligned pages. In particular, I will use my own page, ThinkingPinoy. Note, however, that are other Duterte-aligned Facebook pages that are far more influential than ThinkingPinoy, such as TNP – Trending News Portal and Mocha Uson Blog. 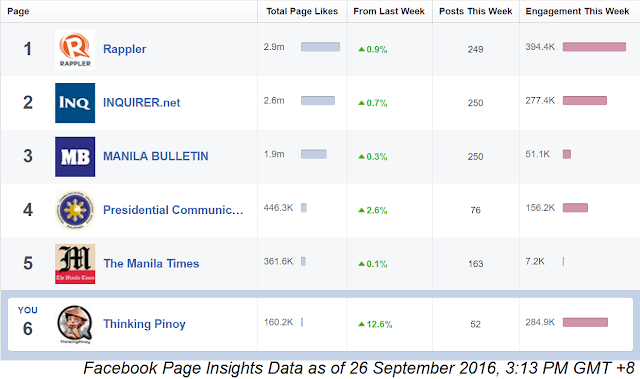 I discovered Facebook Page Insights in late August, and I was shocked to discover the the performance stats of Rappler, Inquirer, Thinking Pinoy, and other related pages. The data from the past couple of months suggest that ThinkingPinoy may actually challenging both Rappler and the Inquirer in terms of influence on public opinion. What's more alarming is the fact that ThinkingPinoy is NOT the most influential member of the Millennial Mosquito Press. 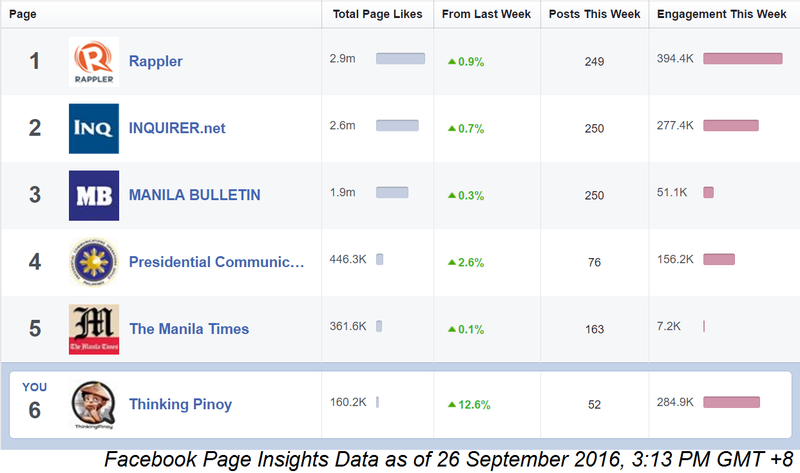 Mocha Uson and TNP- Trending News Portal enjoy far higher engagement figures than TP. At face value, Rappler's and Inquirer's main problem is ego, but in reality, they may be facing something more alarming that just losing bragging rights. They may not be making enough money. Mainstream media companies require profits to survive, and they derive this mainly from advertising in their respective websites. Thus, driving web traffic into their sites is key. The best-paying advertisement network today is Google Adsense, and all three sites have Adsense ads embedded in their pages. For August 2016, ThinkingPinoy (my site) received approximate Php 18,000 pesos. Now, Rappler has about 30 times, while Inquirer has about 44 times, my site traffic. That is for August 2016, Rappler should have received around Php 540,000, while Inquirer received Php 792,000. Of course, there are many other variables that affect ad revenue, so let's just give Rappler and Inquirer the benefit of the doubt by assuming that, for August 2016, they earned Php 1 million and Php 1.5 million, respectively. Facebook is a powerful tool to gain influence and thus, drive traffic to one's website. However, it does not make money in the strictest sense of the word. Facebook has monetization platforms, but its more of a joke than anything else. For one, it announced plans of allowing publishers to monetize videos [Forbes], but it has yet to implement this feature. In short, Facebook content does not make real money. Now, my 18,000 plus donations amounting to about P5,000 a month is just about enough to pay for my internet bill (Php 4,000), electricity (Php 5,000), and my living expenses (food, clothing, rent). I focused full-time on TP so I don't have a day job right now. And when I fall short, I borrow money from real-life friends. That hasn't happened yet, though. I know how to live within my means. SIDE NOTE: Well, I’m sorry to burst Ressa’s bubble but behind TP is me, a one-man team. Behind Sass Sasot is her, a one-woman team. Behind Mocha is Mocha, a one-woman team. Contrary to what you'd like believe, Rappler is not the most social media savvy entity on the planet. Yeah, masakit sa dibdib para iyo na tanggapin 'yan, lalo na kung totoong palugi ka na. Basically, even if it's difficult, ThinkingPinoy is managing to survive. The same goes for other non-profit "millennial mosquito press" outfits like Sass Rogando Sasot (who does everything for free), MindaNation (which is run by a very lean team of less than 10 people). Now, 1 million pesos divided by 50 heads amount to only 20,000 pesos per person. That's not a living wage for journalists in Manila. Add maintenance and other operating expenses, I find it hard to imagine how Rappler can survive with monthly revenues of just Php 1million. We can even assume a monthly revenue of Php 2 million, and it still won't be enough. The same goes for the Inquirer, although it can be argued that they sell print newspapers, which also help boost revenue, though arguably by a relatively minimal amount. But then, the Inquirer is a much larger organization, most probably employing over twice the number of Rappler's employees. Simply put, it's very likely that their operating costs grossly exceed their revenues. In business, that's called "heading towards bankruptcy." Contrast that to small and independent Millennial Mosquito Press players who are essentially non-profit and thus are willing to work on pennies and peanuts, who do what they do for love of country. If this is true, where do Rappler and Inquirer get the extra money to balance their books? In terms of social media influence, the poorly-funded Millenial Mosquito Press is rivalling heavily-funded mainstream media players like the Inquirer and Rappler. That fact in itself is shocking, but what's more shocking is the fact that non-TV mainstream media players are starting to feel the financial impact, as they appear to be losing the profitability that they too easily enjoyed in the past.